‘It has a southern feel’. That’s what I thought during my first stroll in Llerena, even before reaching the main square. 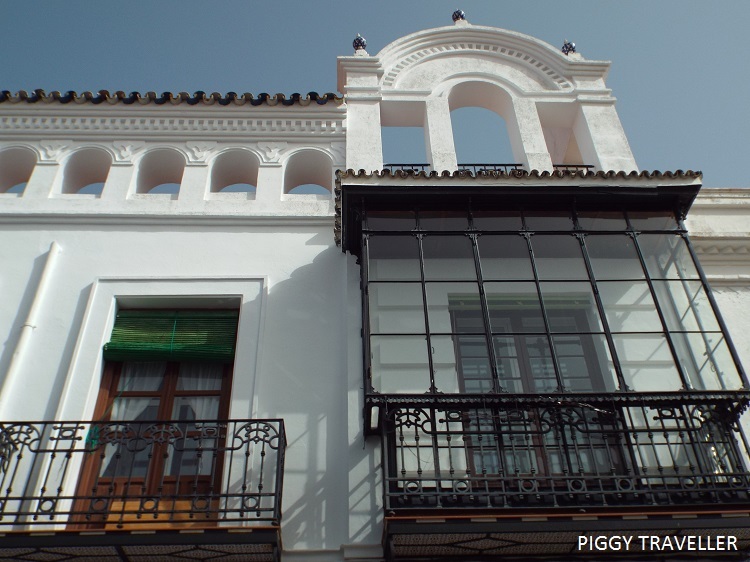 Its two-storey whitewashed houses, big windows with wrought iron grilles and old-style roller blinds reminded me of Jerez de los Caballeros, despite Jerez being on a hill, and Llerena being as flat as a pancake. Another thing both towns have in common is the endless number of religious elements they have, from churches to convents to former hospitals. But not only that. 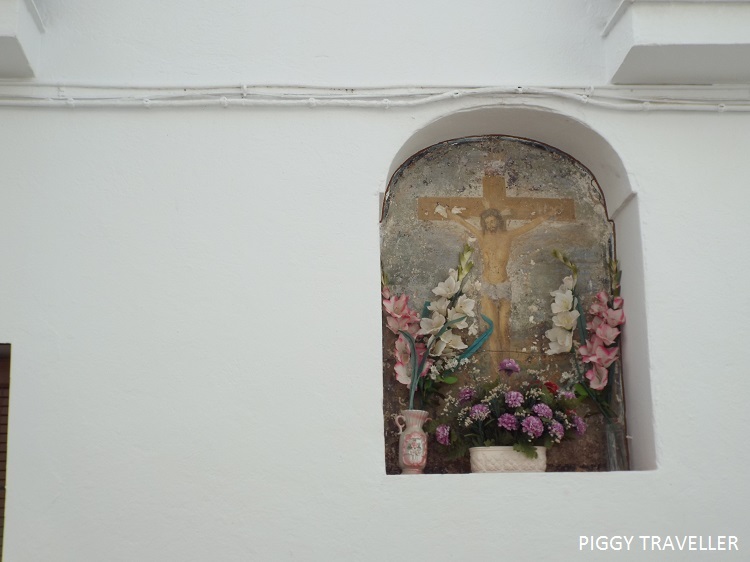 Like jerezanos, Llerena residents display religious symbols on their houses – from tacky mosaics depicting a Virgin, to somewhat creepy and sanctuary-looking alcoves built on the façade. I imagine this is a southern thing, because I haven’t found it in other parts of the region. 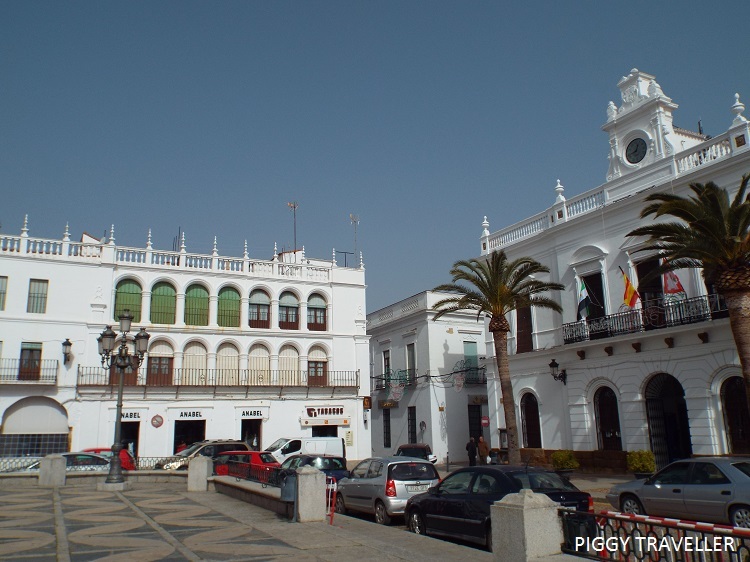 Llerena is a pretty little town that makes a good day trip from Mérida or Zafra. 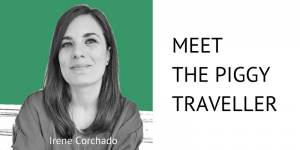 If you’re planning a trip to the south of Extremadura, include it in your itinerary if you can. To give you a good idea of what to expect there, have a look at what to see below! 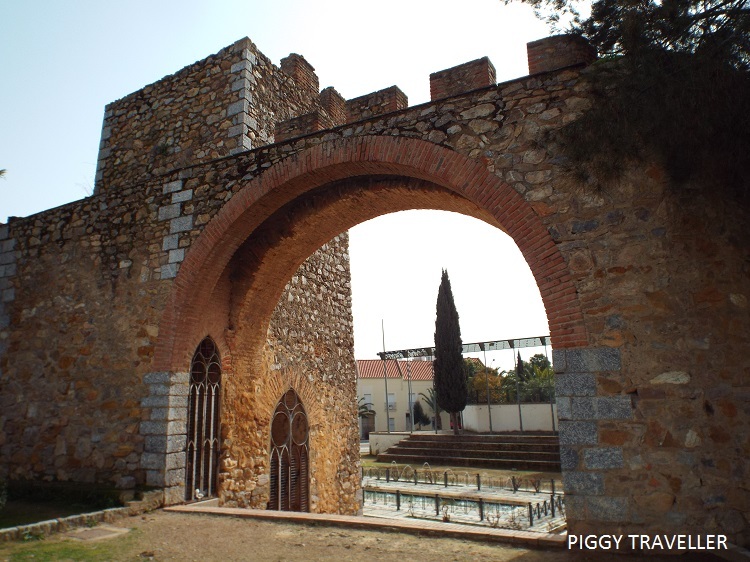 Llerena’s walls were built in the 14th century and gave access to the town through several gates. Today, only two remain – Puerta de Montemolín and Puerta de Villagarcía. 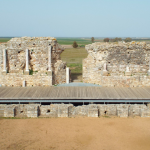 One of the best-preserved sections of the walls can be seen in Paseo de Cieza de León, to the southwest of Llerena. Outside the walls there is an open area with a fountain in the centre and a few rows of seats. There’s also a statue of Llerena-born conquistador and historian Pedro Cieza de León. 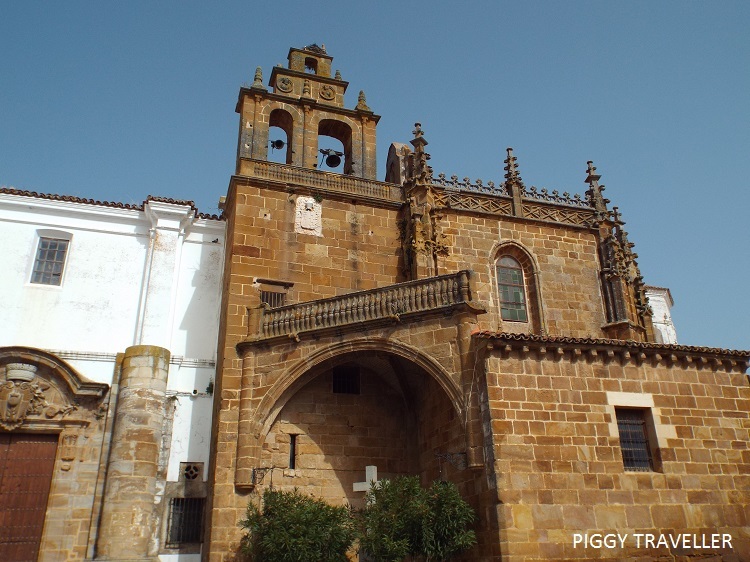 It’s probably the biggest highlight of Llerena, a large square with beautiful arcades and what is, in my opinion, one of the prettiest churches (from outside) in Extremadura. 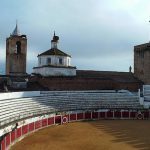 The square has various uses throughout history, one of them being a makeshift bullring. On the eastern side of the square you’ll see the town hall (the Tourist Office is just around the corner) and a small fountain by the arcade. 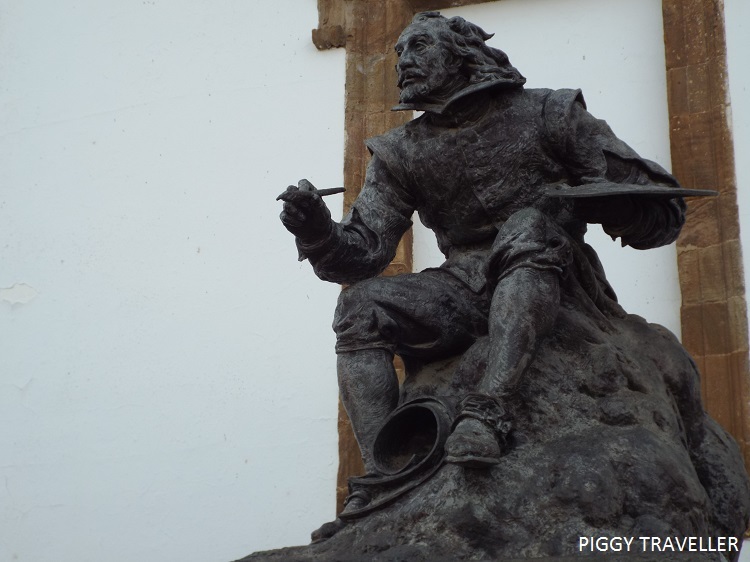 The fountain was designed by famous painter Francisco de Zurbarán, who lived and worked in the house in front of it. The square has the same bright and southerner look than the rest of the town, with whitewashed façades and old-style green roller blinds. The first thing that will catch your attention as soon as you set a foot in the square will be the church. 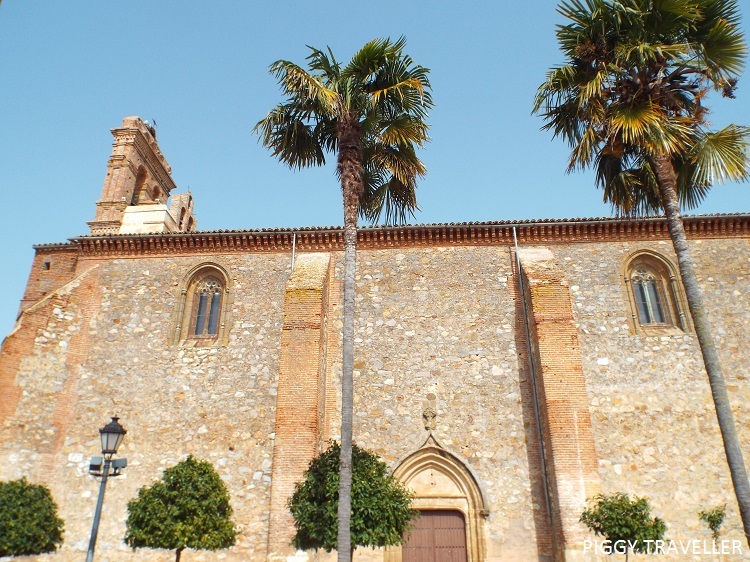 It displays a mix of different architectural styles – its construction began in the 14th century following a Gothic-Mudejar style, but later on, they added Renaissance-style chapels and an imposing 17th century-tower. The exterior of the building is quite unusual, with two rows of balconies that, apparently, were formerly used as a box seats to watch events taking place in the square. Entry to the church is free, and inside you can see the Baroque room home to a statue of the Virgin and several paintings from Zurbarán. A statue in honour of the painter can be seen just outside. 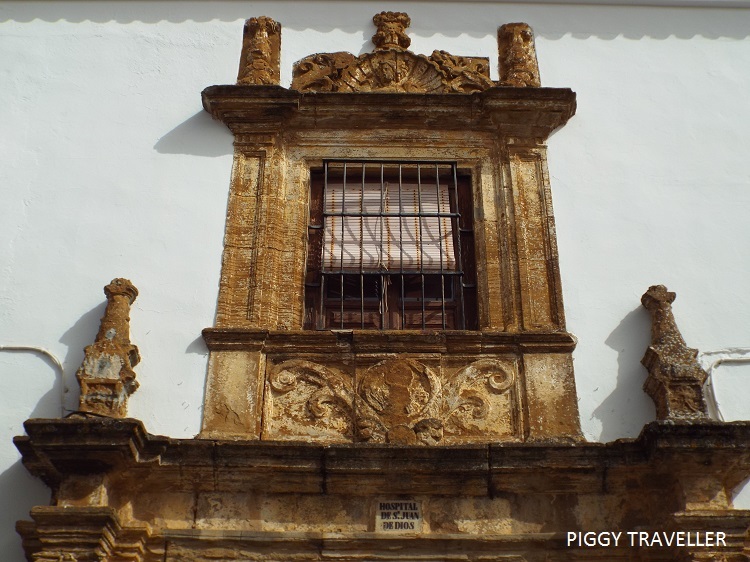 Walk around the church to see San Juan’s Renaissance-style chapel right at the back and have a better view of the tower from plaza de San Juan. 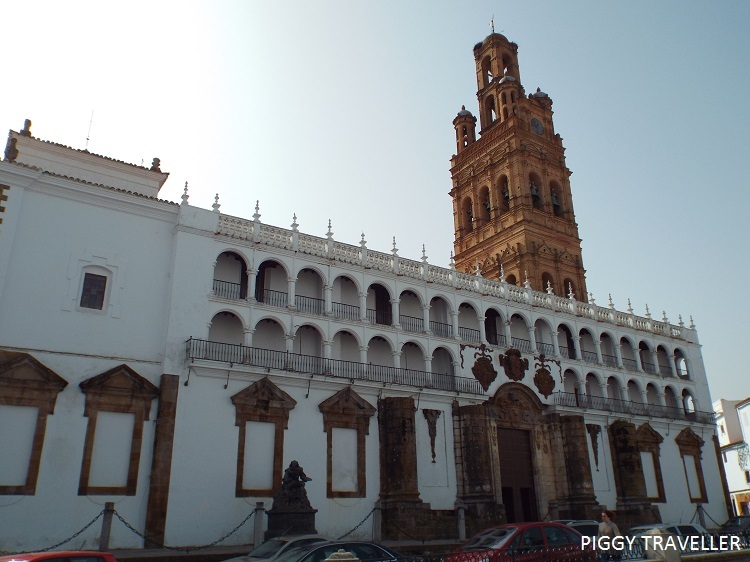 Less than five minutes by foot from the main square you can visit the Santiago church. Unfortunately, it was closed when we went, so I can’t comment on the inside – apparently, there is a Baroque altarpiece and Gothic marble statues. Behind the church there is nice little square (plaza Cervantes) with palm trees. 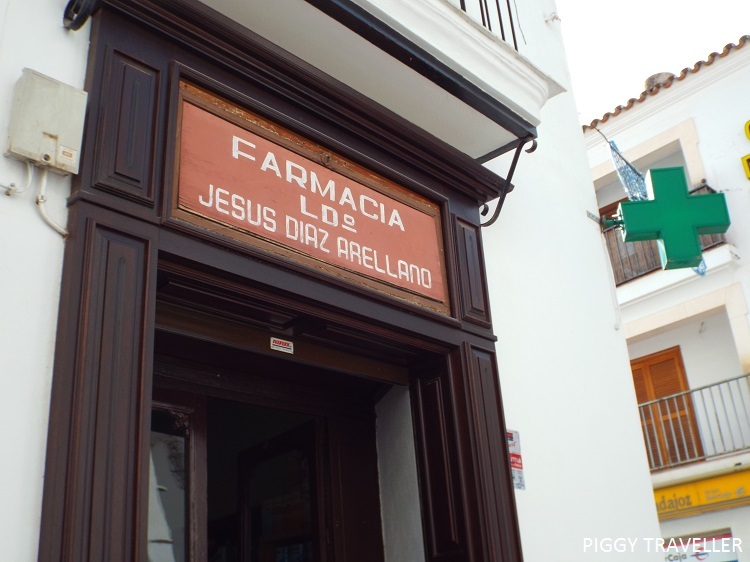 Llerena used to have many religious hospitals, but only one remains today in calle Santiago, just a few metres from the Santiago church. There are no official opening hours displayed and it was closed when we went, but its Baroque façade is worth passing by. The building next door, however, is open, so make sure to peek in. It used to be a church belonging to the same religious order as the hospital, but it has been turned into a public library. 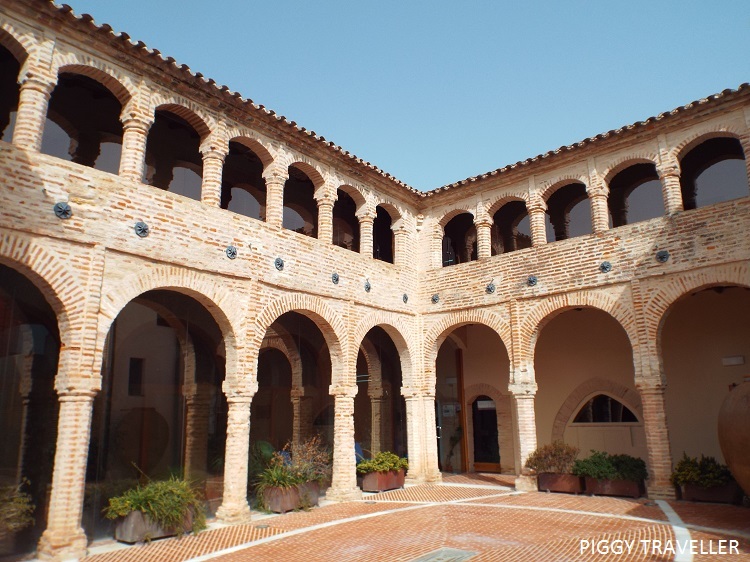 This was built as a private residence on the 14th century, and in 1576 it became one of the three headquarters the Spanish Inquisition had in Llerena. After being refurbished in 2009, it’s now home to several provincial and local authorities’ offices and a local craftsmanship promotion centre. Access is free to its Mudejar-style patio. 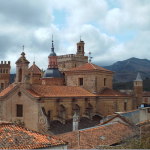 There are other relevant buildings worth seeing, such as Santa Clara convent, La Merced Cultural Complex or the local History Museum (Museo Histórico Ciudad de Llerena). Unfortunately, they were either closed or being renovated the day we went. 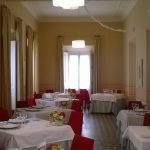 Hospederías are a great option for eating in Extremadura. 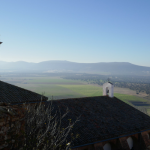 They offer accommodation in buildings of special interest, such as monasteries or palaces with quality restaurants. 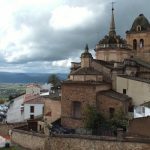 Read my experience at the Hospedería Mirador de Llerena, just two minutes away from the main square. 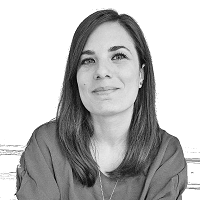 Distance: 42 km from Zafra, 98 km from Mérida, 117 km from Badajoz and 127 from Seville. Tourist Office: (address) calle Aurora 3; (email) [email protected]; (opening times) Mon-Fri from 10am to 2pm and from 5pm to 7pm (summer from 10am to 2pm and from 7pm to 9pm), Sat-Sun from 11:30am to 1:30pm. Look for accommodation in Llerena. No matter where you arrive from, my personal suggestion is to leave the car in the outskirts. Don’t try to reach the town centre by car, as streets are narrow and many of them are one-way only. 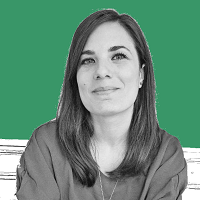 There’s free parking spaces at the bus station (paseo Cieza de León), so I would consider leaving the car there and walk to the centre via the walls. By the way, refrain from using the loo at the bus station. Mum and I had a nasty surprise. We might not have been lucky, but, if I were you, I’d try somewhere else.